PLANNET MARKETING WELCOMES TERESA SHOALS TO THE 20/20 CLUB! 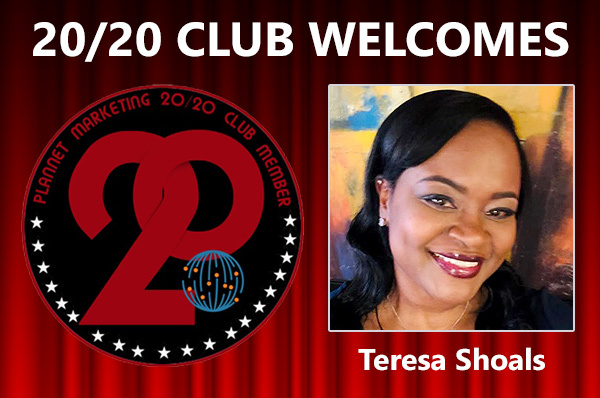 PlanNet Marketing is pleased to welcome Teresa Shoals to the 20/20 Club! Teresa tells us, “Thank you so much for this opportunity. I feel so blessed to have reached the 20/20 achievement and with you allowing me to share some of my journey. I am from Shreveport, Louisiana and currently reside in Alexandria, Virginia, where I serve as Active Duty Army. My interests include ministry, sports (diehard Cowboys fan), cooking, music (listening, dancing and singing), mentoring, and spending time with my daughters who LOVE to travel just as much as I do. I’ve had the opportunity to travel to various places, including Germany, France, Hawaii, Jamaica, Bahamas, Cancun, Dominican Republic, Middle East, Mexico, Guam, Somalia, and all over the United States. “My success is attributed to Mr. and Mrs. Bradley’s vision and this amazing opportunity, which makes me excited to share with anyone I come in contact with. When you love what you do, the people you present the business to also feel that love and excitement. I also attribute my success to surrounding myself with exceptional individuals: Five-Star Director, Mr Orlanda Moore; Three-Star Directors, Mr. and Mrs. Scott and Mr. and Mrs. Hendricks; One-Star Directors Arien Ragster and Erica Ledet; DITs Mr. and Mrs. Young, and my battle buddy Jennae Pitts. Being surrounded by individuals who are willing to coach, mentor and assist you with achieving your professional goals is normally unheard of in business - but not in PlanNet Marketing. PlanNet Marketing is more than just a business to me, it’s a family! “Staying committed to learning and growing in the business will bring you much success. Stay plugged in, remain coachable, ask questions, never give up, and remember you are in business for yourself but not by yourself!